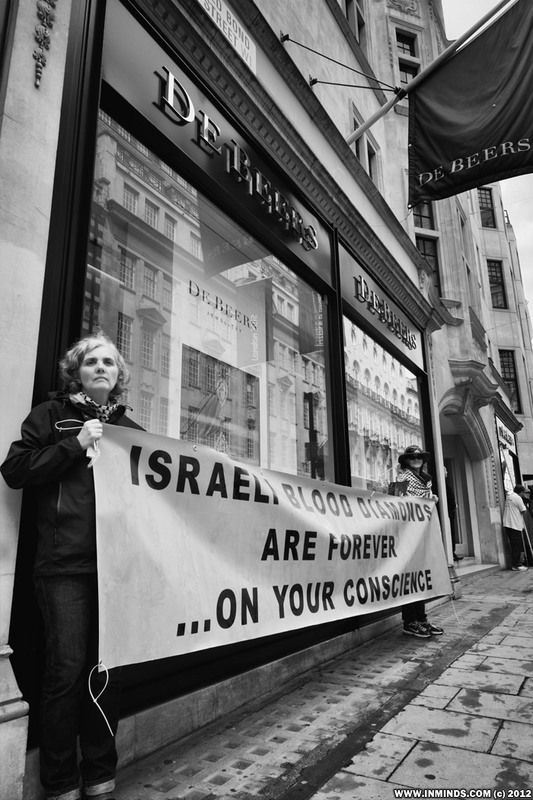 On Saturday 7th July 2012 Human Rights activists protested outside De Beers London Headquarters on Old Bond Street over De Beers flaunting an Israeli blood diamond in the Tower of London. 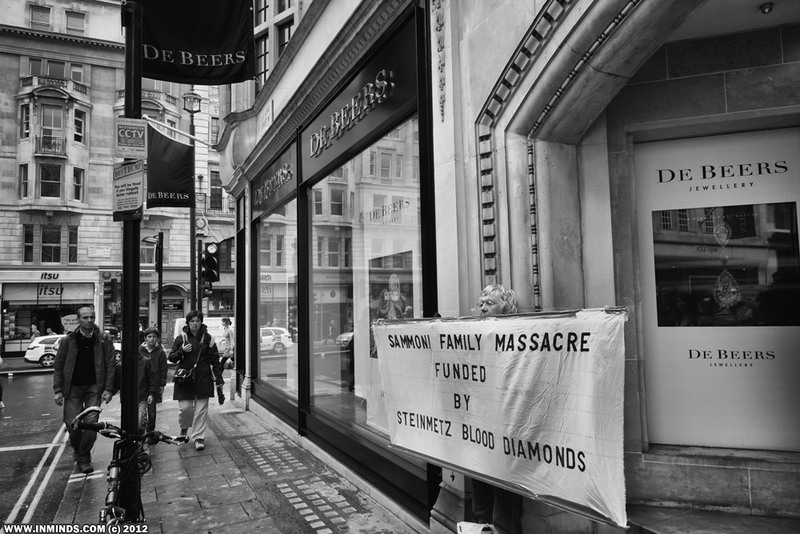 The diamond was crafted by De Beers partner the Steinmetz Diamond company of Israel which is complicit in the massacre of 29 members of the Samouni family in Gaza by its funding of the notorious Givati Brigade of the Israeli army which stands condemned by the United Nations Human Rights Council for war crimes and possibly crimes against humanity. 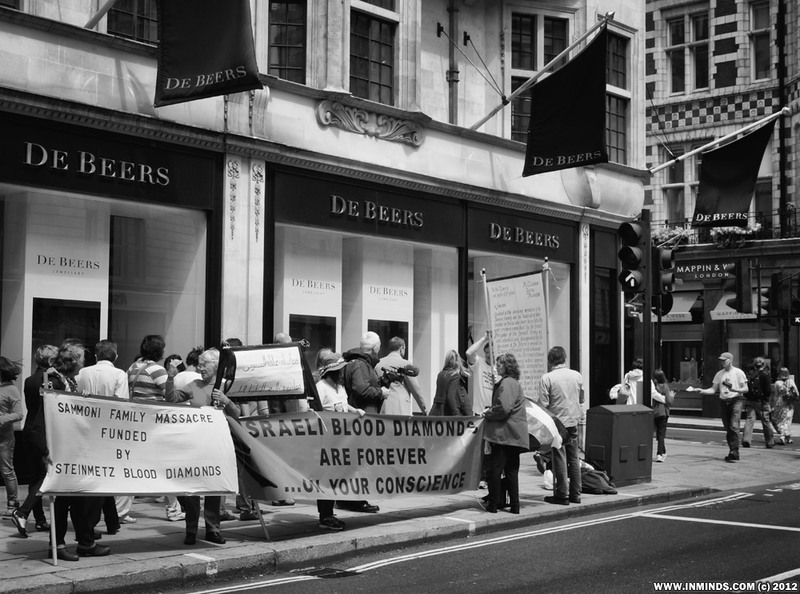 "..We demand that De Beers be instructed to remove this offensive blood diamond display immediately.."
The arabic transaltes to "We stand with the Samouni family - remove the blood diamond"
Londoners showed their full support for the demonstration which lasted most of the day. 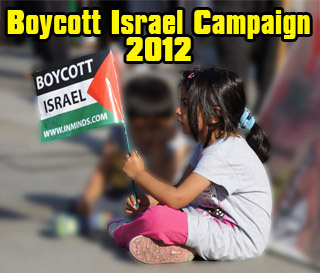 Thousands of leaflets were distributed and it was amazing to see so many people voice their support for the campaign. 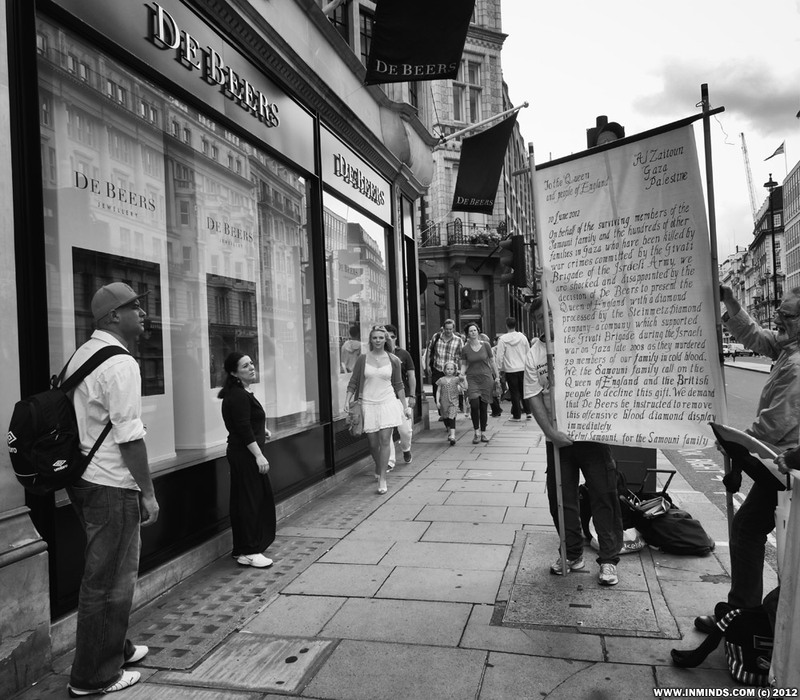 We did not expect dozens of people to stop in the street to read the full message of the Samouni family to the Queen and the people of England asking De Beers to remove the Samouni blood diamond from display. When the last line of the message was creased a member of the public went to unfold it so that he could continue reading the message. 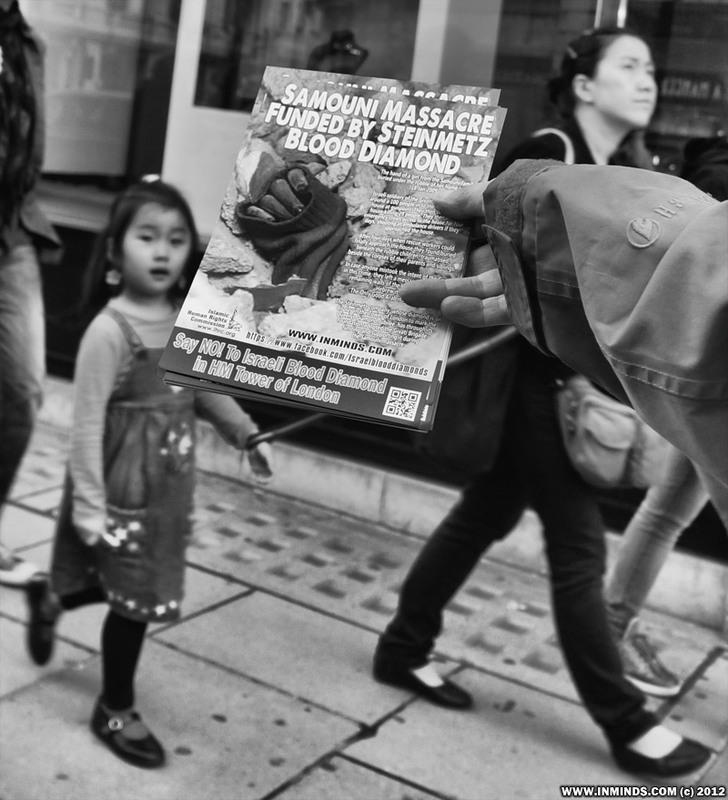 It is clear that that simple message from Gaza has struck a chord at the heart of the British public. 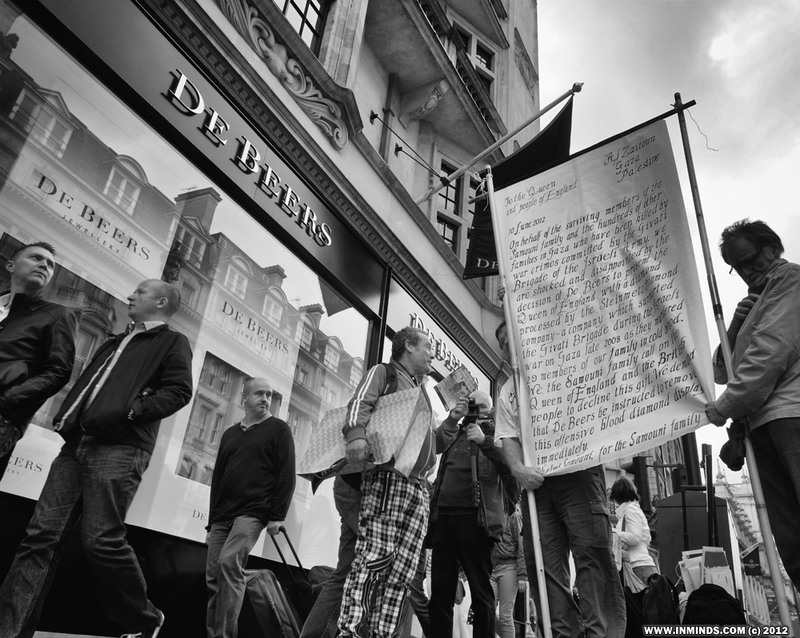 A rare sight in London - people stopping on a main street in London to read a message from Gaza. 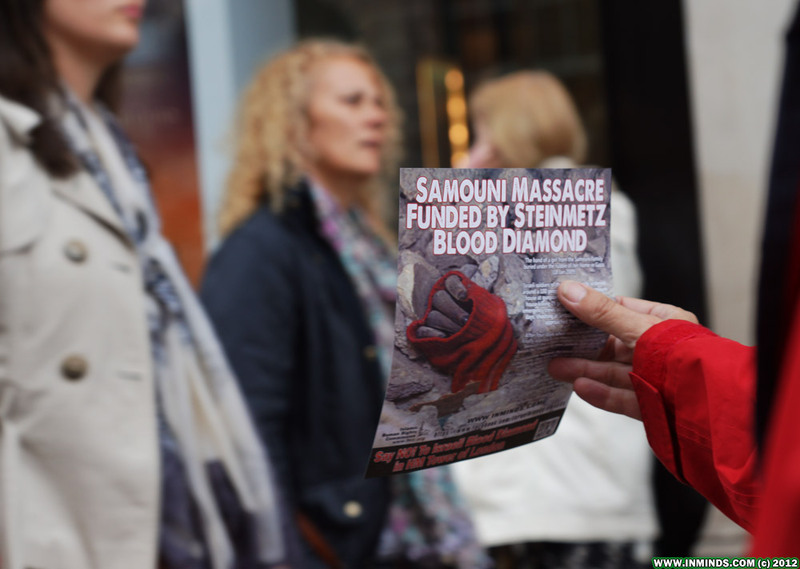 We were giving two different leaflets out on the day - some were handing out a general leaflet about Israeli blood diamonds and the others were giving out a leaflet specificity about the Samouni blood diamond. 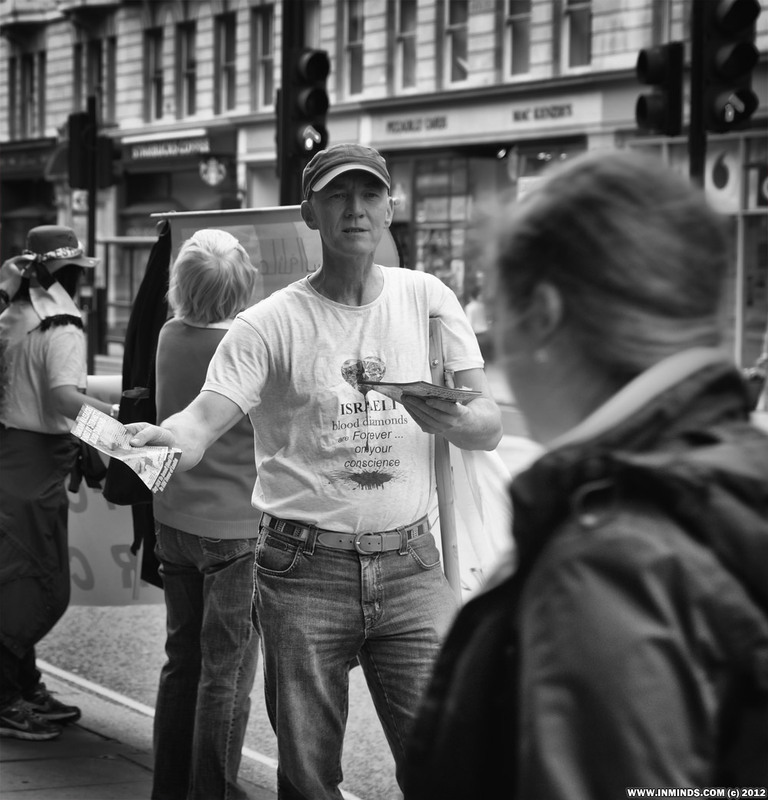 It was interesting to see that on two occasions people who had been given one or the other leaflet come back to collect the leaflet they missed! 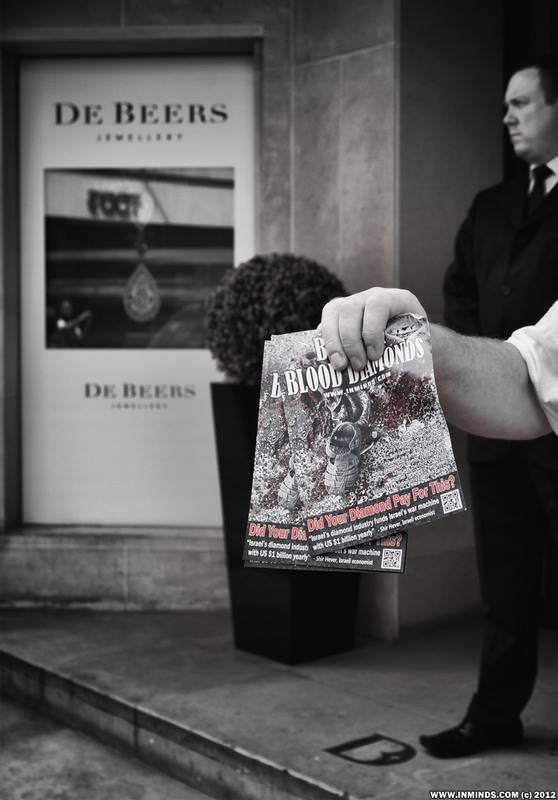 Some were shocked to hear De Beers was embroiled in Blood Diamonds, whilst others where not surprised, one saying "they say they are clean, but I never believed them and now I have the proof!". 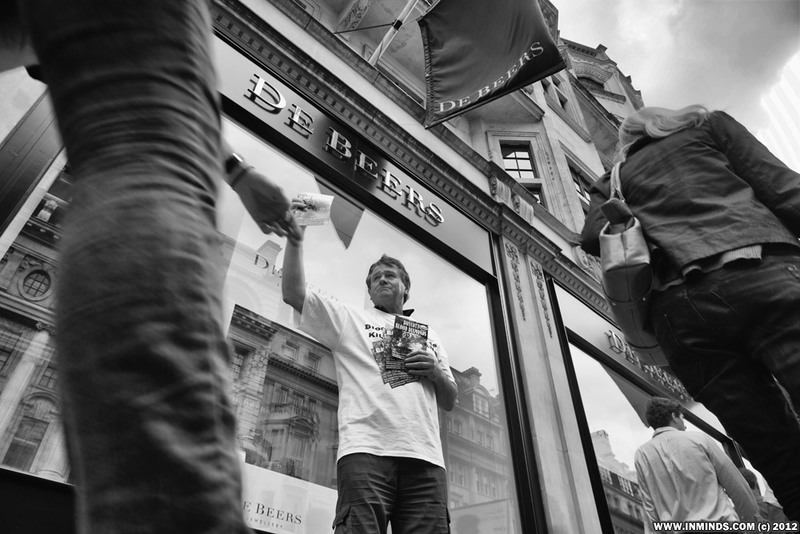 The De Beers security suggested we had picked on the wrong diamond company, we should be picketing their competitors Graff Diamonds! 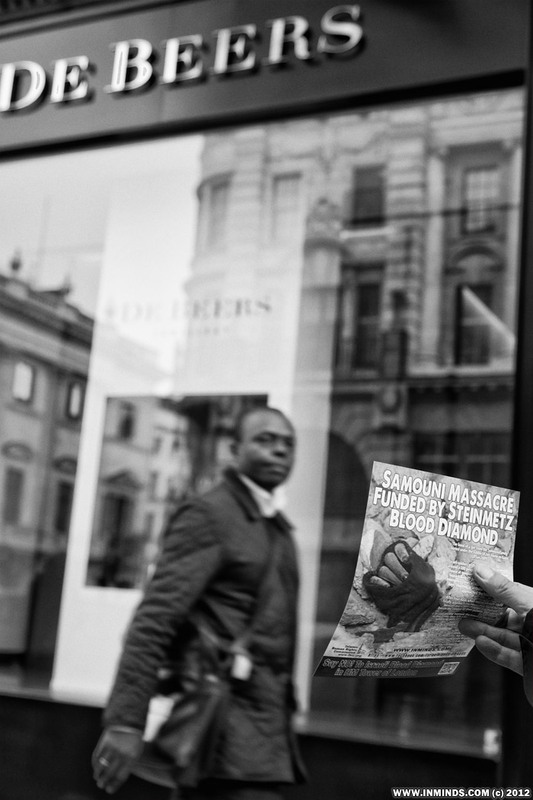 Interestingly for the second week running we encountered a teacher who asked for additional leaflets as she wanted to use the case of the Samouni blood diamond to teach about human rights to her class. This has given us the impetus to create a proper study guide for schools including a students pack and a teachers guide, hopefully in time for next term. If you have any experience in this area and wish to help please contact us (feedback form on bottom right column). 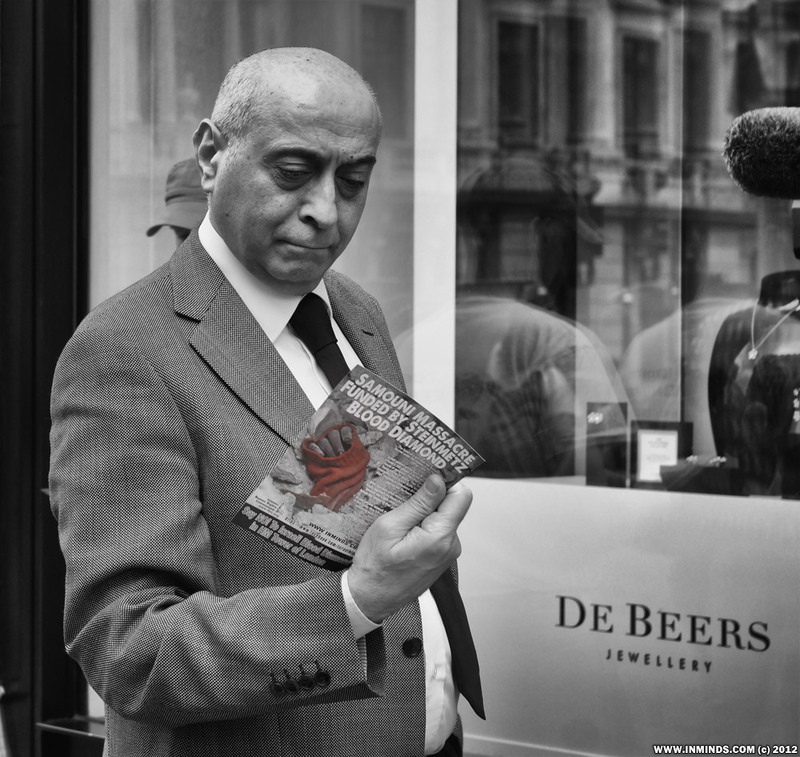 At one point one of the jewellers (we could tell from the jewellers gloves handing from his hip) came out to read the Samouni message and take a leaflet. 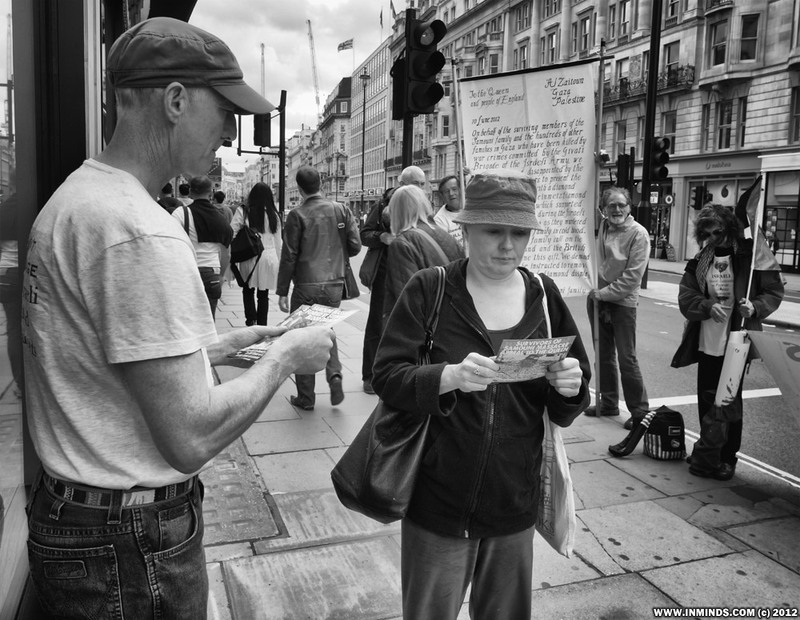 He stood there and carefully read the whole message and took the leaflet and watched for a few minutes the interest the public were showing before going back in. He didn't say one word. We did encounter two Zionists, one physically assaulting one of the female protesters and other shouting hysterically upon seeing Israel being brought to book. 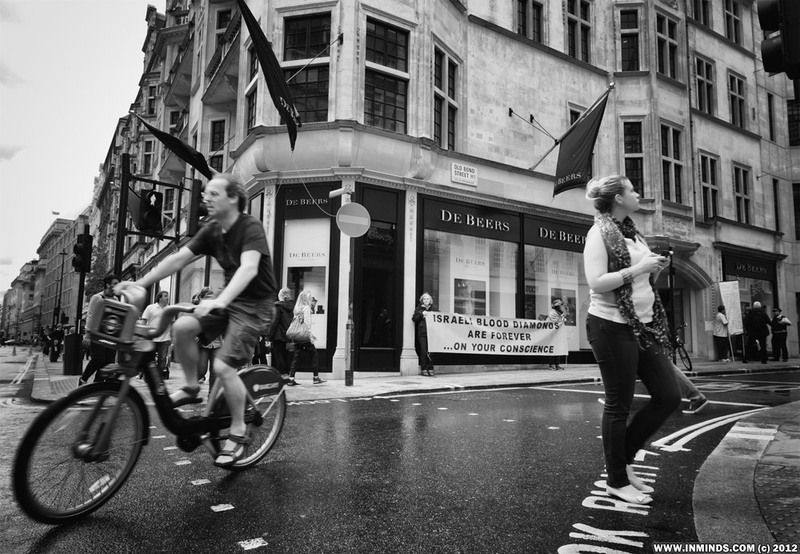 When the female protester was attacked members of the public came to her defence. 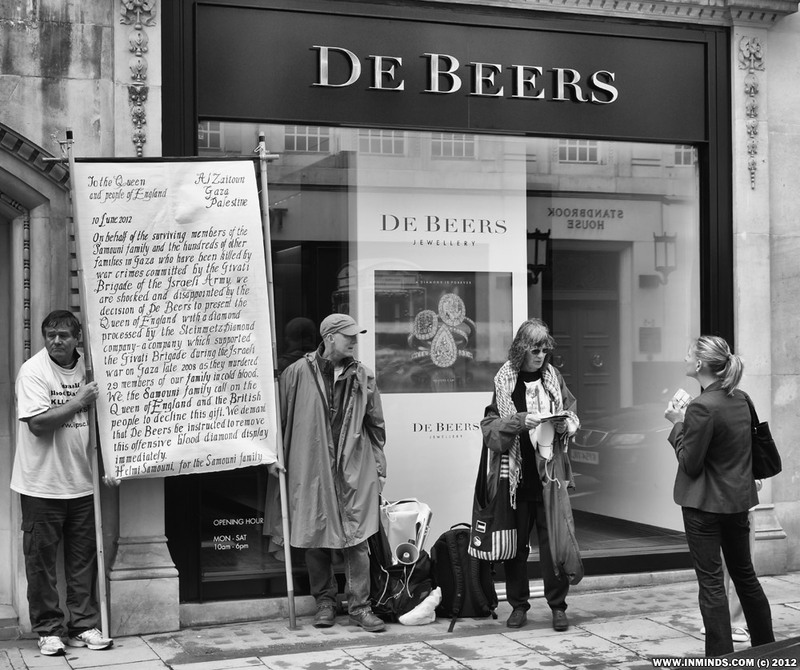 We wished to deliver a letter to De Beers (see below for content), upon seeing us approach the entrance the security guards went inside and locked themselves behind the second set of glass doors. 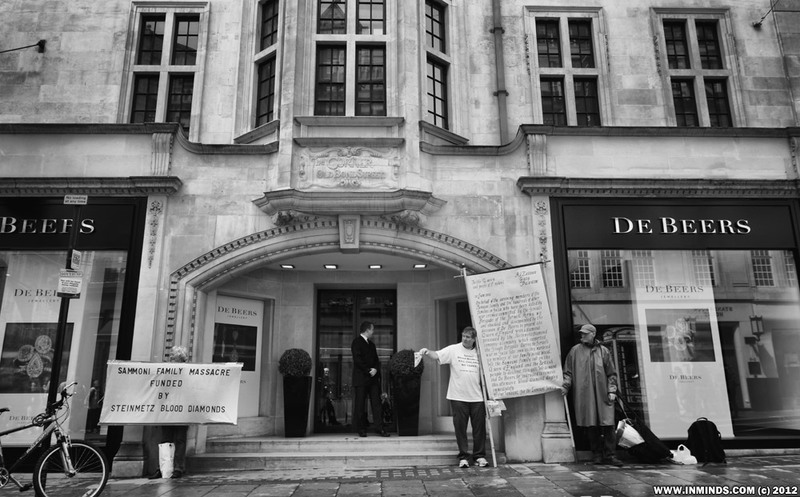 We explained that only one person wanted to come inside to deliver a letter but they refused to open the door telling us to leave the letter on the floor and within a few minutes the police had arrived, no doubt at the behest of De Beers! 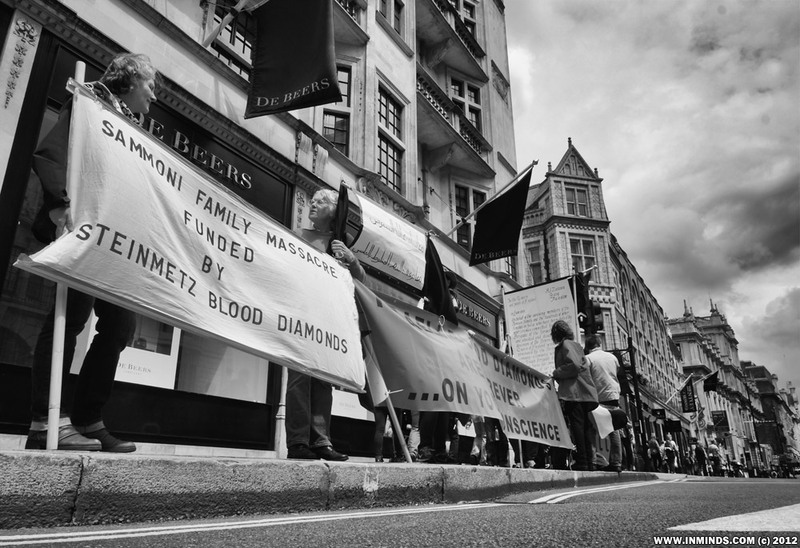 The police were reasonable and recognised our right to protest outside this blood diamond merchant. She was also someones daughter..
"The hand of a girl from the Samouni family buried under the rubble of her home in Gaza (18 Jan 2009).."
The Jubilee Diamond (Samouni Blood Diamond) on display in the Tower of London is a blood diamond. It was crafted by Steinmetz, a company that funds and supports a Unit of the Givati Brigade of the Israeli military and did so during the Israeli assault on Gaza (Operation Cast Lead) in the winter of 2008/2009. The Givati Brigade was responsible for one of the most despicable examples of gross human rights violations documented by human rights organisations and the UN Human Rights Council during the three week assault that resulted in the death of over 1,400 people including more than 300 children. The Givati Brigade was directly responsible for killing 29 members of the Samouni family when they bombed a compound in which they had detained over 100 members of the family. The Brigade prevented emergency medical teams from reaching the wounded and dying for four days. A UN Human Rights Council investigation concluded that Israeli forces committed serious war crimes and possible crimes against humanity during the three week assault on the people of Gaza. 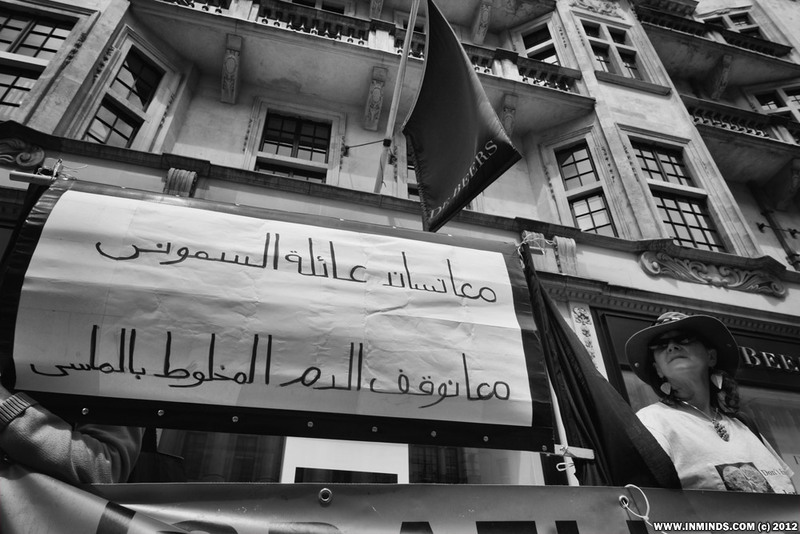 The Samouni family issued a video appeal to Queen Elizabeth II asking for the “offensive blood diamond” to be removed. 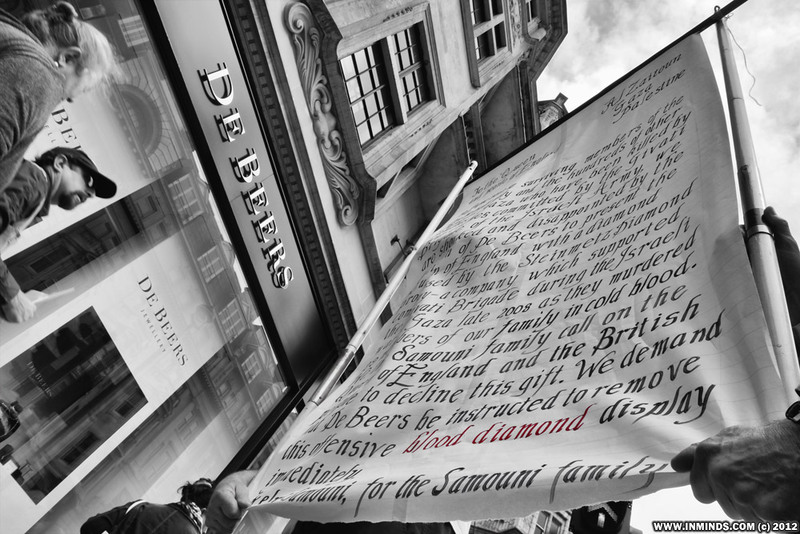 De Beers should respect the wishes of the surviving members of the Samouni family and remove the offensive blood diamond from the Tower of London. 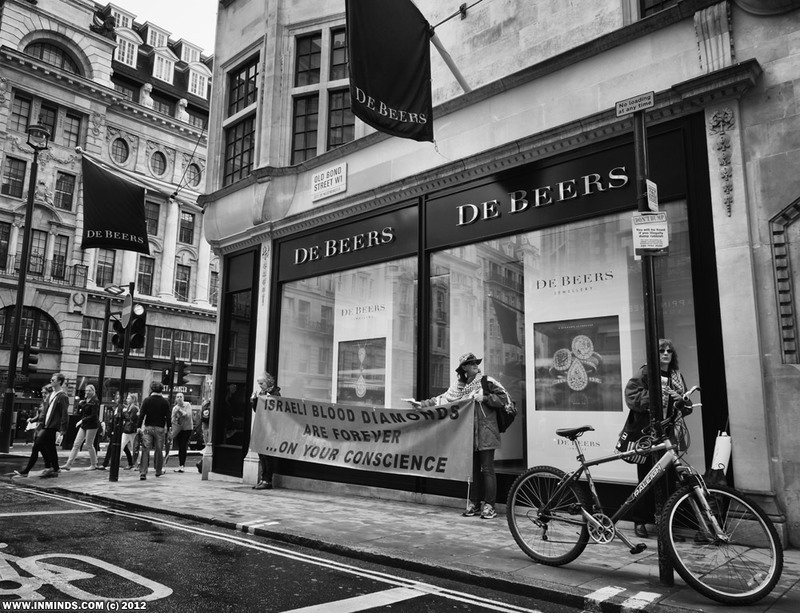 De Beers should withdraw Forevermark diamonds from the market until they can guarantee that none of the companies involved in at any stage in the production and sale of the diamonds are generating revenue used to fund gross human rights violations. 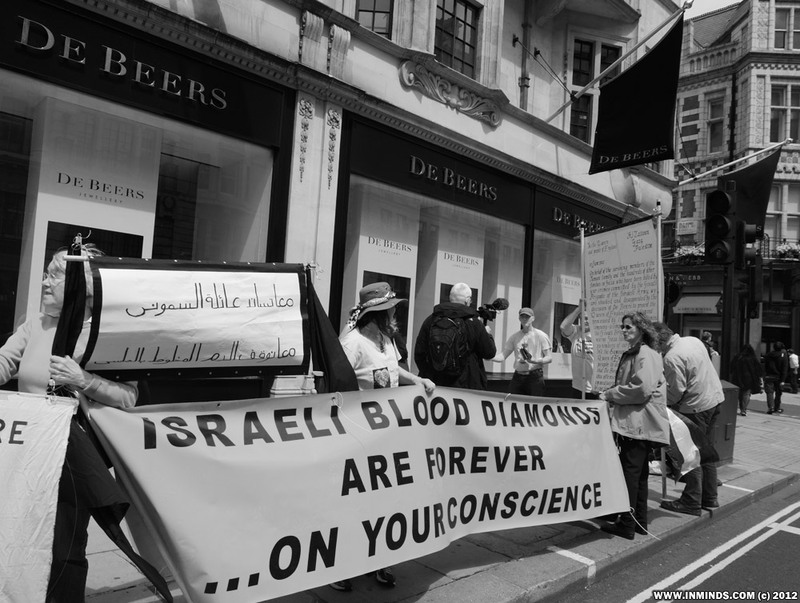 De Beers should end their relationship with the Israeli diamond industry which is a major source of revenue for the Israeli military regime that stands accused of war crimes and possible crimes against humanity. Helmi Sammoni, speaking on behalf of the Sammoni family, issued this appeal to Queen Elizabeth II. The Foundation has “adopted” Tzabar Unit of the Israeli Defense Forces’ Givati Brigade. The Foundation fosters a close relationship with the commanders and their soldiers, helps the brigade organize evening events, buys equipment for end-of-course ceremonies and gives aid to needy soldiers. During Operation Cast Lead in the Gaza Strip, the Foundation helped the Unit purchase complementary equipment as well as visited and cared for the wounded soldiers. The ICRC/PRCS team found four small children next to their dead mothers in one of the houses. They were too weak to stand up on their own. One man was also found alive, too weak to stand up. In all there were at least 12 corpses lying on mattresses. In another house, the ICRC/PRCS rescue team found 15 other survivors of this attack including several wounded. 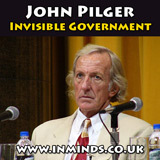 In yet another house, they found an additional three corpses. (Consumers) “…they want to know that our diamond is from a responsible source and that they can trust it.” and “We are a diamond company and that’s all we do. We mine $6 billion worth of diamonds every year and that‘s a high risk profile for any business. We can’t afford to have problems with diamonds. 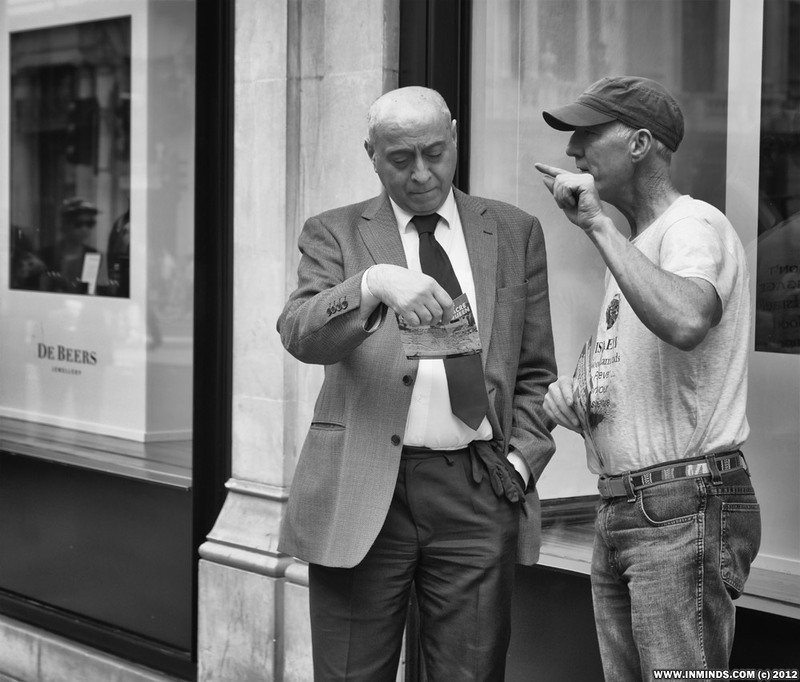 All of you who are selling diamonds as jewellers, we are ultimately a discretionary purchase. 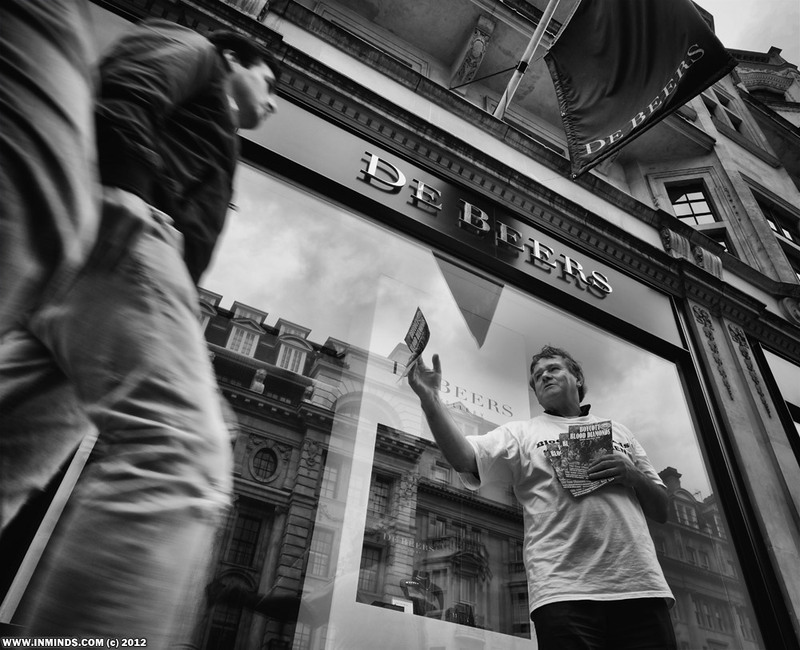 We rely on the fact that the consumers truly believe in the diamonds that they buy. If that promise gets unhinged in any way then economic value is eroded very very seriously and clearly as De Beers, that’s a huge risk for us and we can’t afford that to happen. So it’s vital we have to do this (Forevermark Promise) in my view and it is why De Beers have done what they have done”. In response to a question from Alan Martin, Partnership Africa Canada, about the percentage of trade Forevermark represents for De Beers he said Forevermark represents “the vast majority of value if not volume so clearly going back to the economic issue we are clearly through that process, we continue to grow the credibility of Forevermark we will be protecting the vast majority of our value”.